UPDATE: The Roscosmos State Corporation announced on Wednesday morning that the launch of the ILS Proton Rocket with the Intelsat 31 communications satellite has been delayed to the backup date of Thursday, June 9 with a T-0 target of 7:10 UTC. The delay was called due to an issue with electrical ground system equipment, according to launch operator International Launch Services. The faulty component has already been replaced and re-testing is in progress to set up for a 24-hour turnaround. Making its third launch of the year, the Proton-M/Briz-M rocket will be tasked with a long mission of 15 hours and 31 minutes to deliver the 6,450-Kilogram satellite to a Supersynchronous Transfer Orbit. 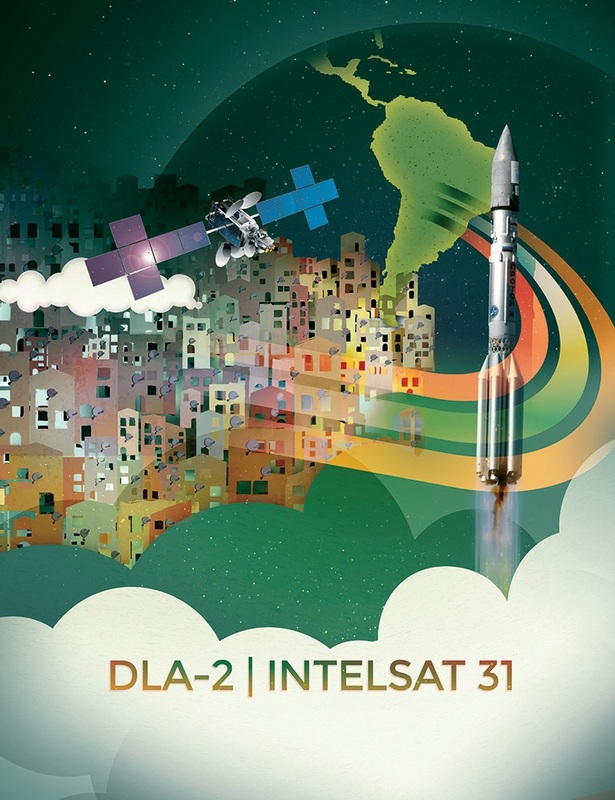 Intelsat 31, also known as DLA-2, was built by Space Systems Loral based on the flight-proven LS-1300 satellite platform. 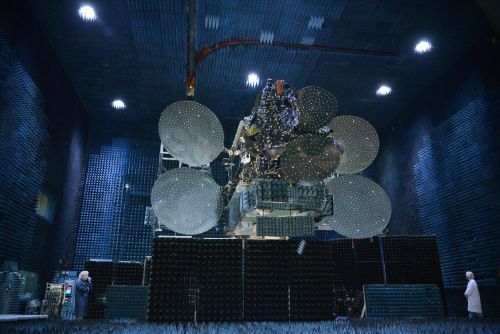 The satellite carries a powerful communications payload comprised of 72 Ku-Band transponders operated by DirecTV Latin America to deliver Direct-To-Home television services. Four additional C-Band transponders are employed by Intelsat to expand its coverage in the Latin American market. The satellite will take up a position at 95°W in Geostationary Orbit, co-located with the Galaxy 3C satellite and Intelsat 30 that launched in 2014 and also delivers DTH for DirecTV Latin America and C-Band coverage for Intelsat. The DLA constellation aims to deliver expanded entertainment services, backup and restoration services. 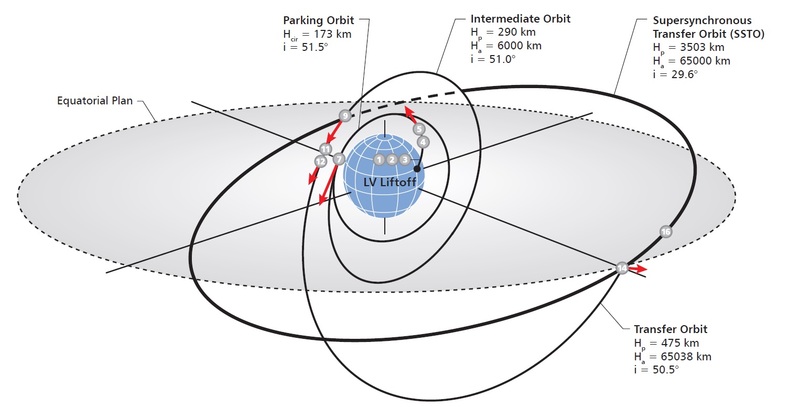 To deliver Intelsat 31 to a high-energy orbit, Proton utilizes its Phase IV performance enhancement. The stepwise evolution of the Proton launcher was initiated in 2001 when the Proton first flew in a modified version with greater payload capabilities. The Phase I improvements were implemented by 2004 followed by Phase II in 2007 and Phase III in 2009. These different vehicles were flown in parallel until 2013, being chosen based on payload requirements. The improvements that were implemented include the use of modified first stage engines operating at higher chamber pressures, reduced tank wall diameters for weight reduction and mass reduction of interstage structures and avionics systems. The Phase IV Proton uses a composite second stage forward bay, new five-axis milling techniques to reduce tolerances on the second stage and decrease the overall mass of the launcher. The third stage switched the metal alloy from which its tanks are manufactured and also features a composite instrument bay. Modifications of the Briz-M include weight reduction on the Telemetry System and an improved composite overwrapped pressure vessel tank design in the high-pressure section of the propulsion system. The Phase IV payload fairing uses optimized composite shell technology. 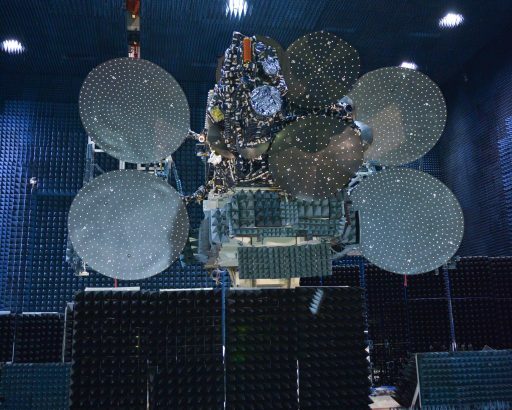 The Intelsat 31 launch slipped from May 28 to a June 8 target due to an issue with a control system component of the Briz-M’s thermal control system that required replacement. 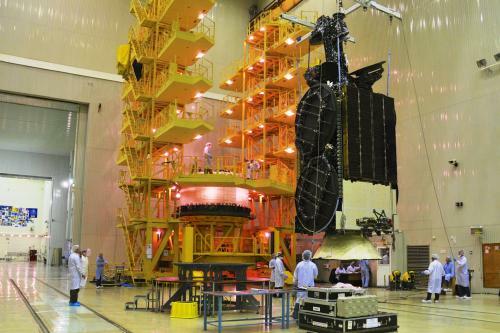 Intelsat 31 left the production facility of Space Systems Loral on April 24, flying to the Baikonur Cosmodrome aboard an Antonov cargo aircraft. The spacecraft completed the last leg of its trip by rail and entered an extensive testing campaign once unpacked from its shipping container. 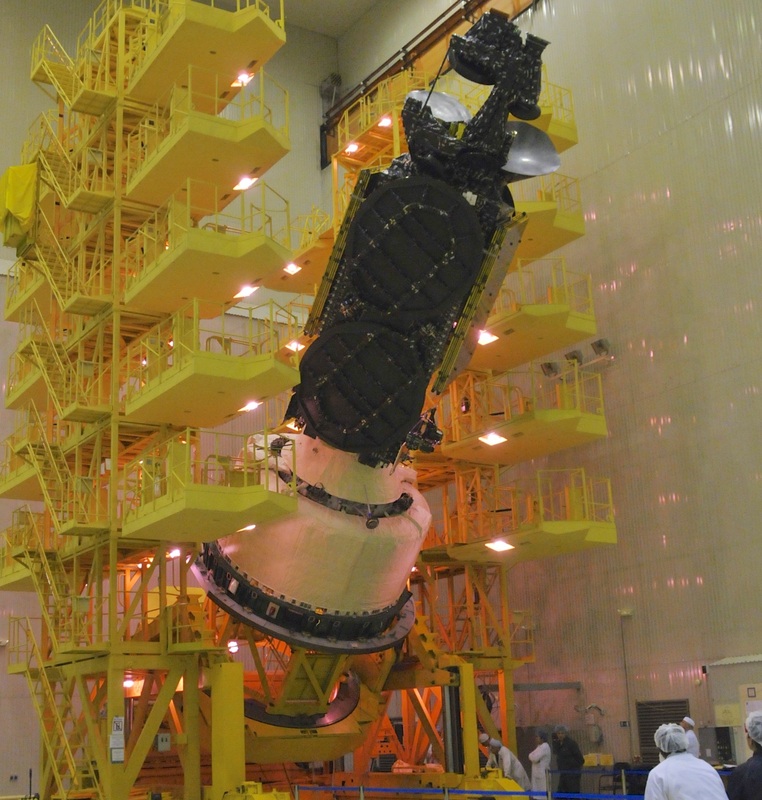 The fully fueled Intelsat 31 spacecraft was installed atop the Briz-M Upper Stage in late May and the stack was encapsulated in the protective payload fairing before being moved to the 111 processing facility where the Proton-M rocket underwent assembly after an early May arrival at the Cosmodrome. On Saturday, the 58-meter tall Proton emerged from its processing facility and was moved over to the Briz-M fueling station for a one-night stay. Briz-M received 19,800 Kilograms of hypergolic propellants for use during five main engine burns. 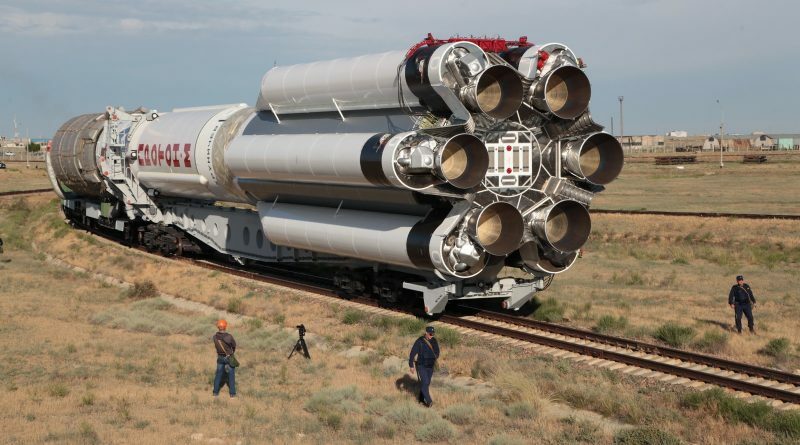 Proton-M was moved to the launch pad at Site 81/24 on Sunday, beginning its trek at the traditional early morning hour. Arriving at the launch pad, the vehicle was moved to its vertical liftoff position and the large Service Structure was rolled up to the vehicle to provide access platforms for engineers. 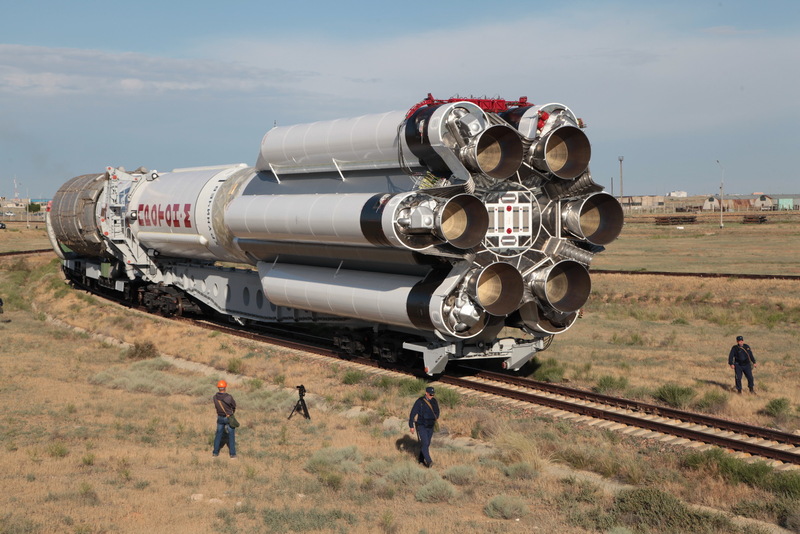 The Proton rocket is set for a three-day on-pad campaign to complete a final round of testing prior to heading into countdown operations in the early hours on Wednesday. Liftoff is currently targeting Wednesday at 7:10 UTC, 13:10 local time. Proton-M countdown operations kick off 11.5 hours ahead of the planned 07:10 UTC launch time with the activation of the Briz-M upper stage for checkouts and software load. 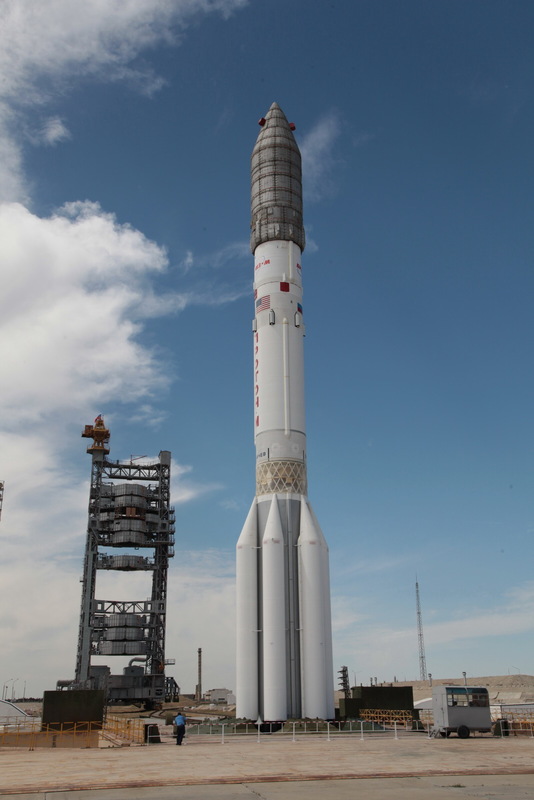 Proton-M is powered up seven hours ahead of launch for final setup steps ahead of propellant loading. The Russian State Commission approves the rocket for tanking, starting at L-6 hours to fill the three stages with 622,000 Kilograms of hypergolic propellants. When the pad is re-opened after fueling, final hands-on work will be completed including the removal of protective covers and the close-out of the rocket and Servicing Structure. One hour ahead of liftoff, the Service Structure is rolled back to a safe position for launch, exposing the fully fueled Proton rocket. The Master Countdown Sequence gets underway a short time later and a set of reconfigurations is completed to prepare the rocket for the automated countdown sequence that starts at T-5 minutes. Soaring to life 2.5 seconds before blastoff, Proton’s six engines will reach their liftoff thrust of more than one million Kilogram-force. The Proton rocket will follow its standard ascent profile, beginning with a short vertical ascent before completing a roll maneuver to line up with its precise ascent trajectory. Proton-M stands 58.2 meters tall and measures 7.4 meters in diameter with a launch mass of 712 metric tons. Its first stage is 21.2 meters long hosting a large oxidizer tank that is surrounded by six fuel tanks holding a total of 419,400 Kilograms of propellants fed to six RD-275M for a liftoff thrust of 9,942 Kilonewtons. Proton’s second stage has a smaller diameter of 4.15 meters and is 14.5 meters long, holding 156,113kg of propellants to be consumed by a cluster of four RD-0210-type engines. The third stage is 6.5 meters in length launching with a propellant load of 46,562kg. It is powered by a single RD-0213 main engine with a four-chamber RD-0214 vernier. Sitting atop the third stage is the Briz-M Upper Stage that weighs 22 metric tons, being 4.1m in diameter and 2.61m long – consisting of a central section and an Auxiliary Propellant Tank. Briz-M is powered by an 19.6kN S5.98 engine that can support up to eight re-starts. The Upper Stage and Payload are protected by a fairing that is 4.35 meter in diameter and 15 meters long. Passing Maximum Dynamic Pressure 62 seconds after launch, Proton heads uphill as the first stage rapidly accelerates the vehicle. At T+1:59, the first stage will shut down its engines. As part of hot-staging, the second stage ignites its four 599-Kilonewton RD-0210/0211 engines at the moment of stage separation to continue powered ascent. The second stage burns until T+5:27. To separate from the second stage, Proton’s third stage will ignite its vernier engine before the large RD-0213 main engine starts its four-minute burn. Payload Fairing Jettison occurs at T+5:47 and the third stage main engine burns until T+9:31. Three seconds after third stage vernier cutoff at T+9:42, the orbital unit is separated. Beginning its five burn mission, the Briz-M upper stage will ignite its S5.98 engine after a very brief coast to conduct a burn of four minutes and 17 seconds that puts the stack into a Low Earth Orbit for a coast phase of a little over one and a half hours to set up for a long burn on the descending node of the orbit with a duration of nearly 20 minutes to raise the apogee of the orbit to 6,000 Kilometers, placing the apogee passage close to the equator. 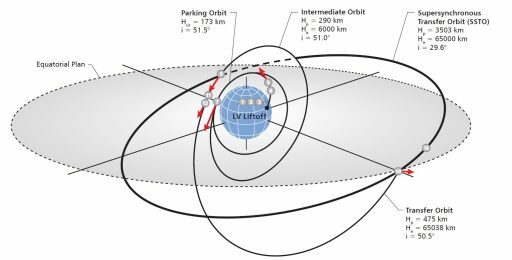 Next is a coast phase of nearly an entire orbit so that the next burn can again take place around the perigee of the orbit, on the next descending node, to continue raising the apogee to reach the desired altitude of 65,000 Kilometers. The third and fourth burn are conducted as a pair, amounting to a total of 18 minutes, only separated by a brief coast during which the spent Auxiliary Propellant Tank is jettisoned from the Briz-M.
After the conclusion of the fourth burn, Briz-M will coast for over ten hours to be able to climb all the way up to the apogee of the orbit for the final burn of the mission that serves as a perigee-raising maneuver and a plane-change, reducing the inclination of the orbit. Spacecraft Separation is expected 15 hours and 31 minutes after liftoff into an orbit of 3,503 by 65,000 Kilometers, inclined 29.6°.